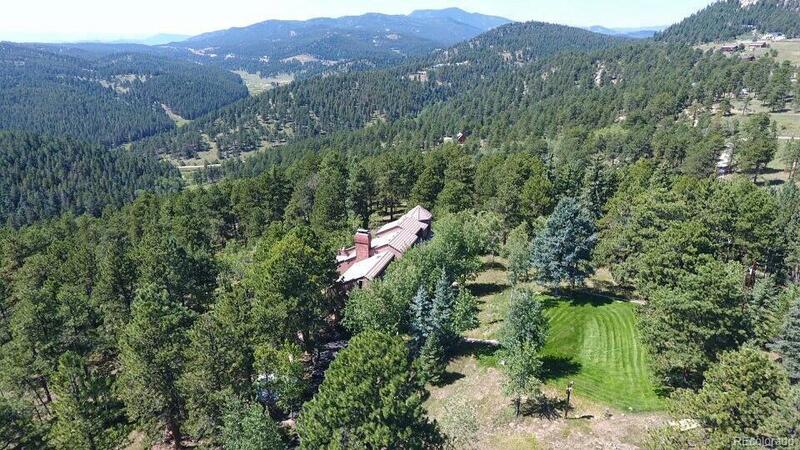 Imagine living on 35 private acres in a meadow and forested setting with gorgeous mountain vista views, perfectly situated just minutes from Hwy 285, schools, and shopping! Now, enjoy the sounds and breezes through the pine trees as you watch the animals, enjoy star-filled nights, and fresh, pure air! Enter into the quality construction of a 2X6 exterior with R-30 insulation and 2X12 on 12â center joists. The exterior boasts $150K in brick & newer stucco siding and a concrete tile roof. Impressive 2-story living room with ashler cut stone, floor-to-ceiling fireplace and sandstone hearth. Master suite with room for nursery or study. Highly functional shared & private spaces including 2 mezzanines and a library. Top level library and office. 4 decks and a hot tub â¦ and views!!! This is a lifestyle! Experience convenience and enjoyable living in the foothills.